We have answered below many of the questions that our customers ask us about the Wireless Traveler data, calling & texting services. Please review these as some may be relevant to you. We would like to hear from you if you have any further questions or would like any assistance with your Wireless Traveler products & services. Please contact us at support@wirelesstraveler.com or call our Customer Service toll free number at 1.866.700.3883. What is a Pocket WiFi Hotspot? It is a device that fits in your pocket, handbag or backpack and goes with you wherever you are traveling. The moment you land at the airport or get off your cruise ship for a land tour, you have access to the internet. The battery in the device lasts up to a day or longer, depending how heavily you use it and how many people are sharing it. Your own secure access to the internet. The range of the Wireless Traveler Pocket wifi is about 50 feet. Up to 10 devices can access your hotspot, but you may wish to keep it a few at a time for faster speeds. Who needs a Pocket WiFi? All travelers can save money with a pocket WiFi. It is great for families, leisure, corporate, mission and study abroad. Keep all your personal information safe with your own pocket WiFi that includes a secure password for access. What Smart devices work with my Pocket wifi? Smart Phones, iPads & tablets, laptops and any other smart devices you plan to travel with. You can of course use the hotel WiFi if it is free, but be sure not to enter any personal information while on public WiFi, such as credit card or bank account information or sensitive passwords. Airports, coffee shops and hotels are notorious for hackers to gain access to your information while traveling. Also, be sure to turn off ALL cellular data roaming on your Smart devices and be in WiFi only, so you are not running up a huge data bill while abroad. Should I rent or buy a Wireless Traveler Pocket WiFi Device? If you are traveling for an extended period of time or if you and your family members travel a few times a year, it makes sense to purchase a low cost device. Simply add a prepaid 30 day data bundle when you travel. If it is a one off trip, then rent for $20 for up to 2 weeks and add whatever 30 day prepaid bundle you require. Either way, the purchase program or the rental will save you on taking out multiple data plans from your own network provider, for each of your Smart devices (ie. Smart Phone, iPad, Laptops) and for each family member. Just one Pocket WiFi device allows everyone to share the data bundle and enjoy the savings! On an individual level, you save by not taking out separate data plans for each Smart device. For multigenerational or family trips, corporate & meeting and incentives, and Study Abroad groups, the savings are enormous. You can purchase 1 GB in Europe for under $100, plenty for a whole family to share for a few weeks! Is the Pocket WiFi safer than public WiFi in cafes, hotels & airports? Absolutely! All public WiFi are open systems and can easily be hacked. Cyber crime and ID theft are on the rise, especially for unsuspecting travelers. The top 10 locations for hackers include Airports, Times Square NY and 5 Star Hotels abroad. The Wireless Traveler Pocket WiFi has WPA2 technology, for the most secure data encryption and to ensure all of your personal and sensitive information stays secure once your enter your password into your device to access your data. Should I use hotel wifi? That depends. Is it free? Does your group each have to pay $10 or $20 a day? Is it safe? Often hotels have a bandwidth issue, particularly during conferences, which is when most business people need access to WiFi. Also, when you leave the hotel for the day, you will not have access to your maps, emails and internet. In summary, the hotel WiFi is great when it is free or low cost, but best to supplement with a pocket wifi hotspot when you are out and about and need access to data. How to use the Wireless Traveler Pocket WiFi? Very simple. You turn on the device, locate it on the WiFi in your Smart Phone, iPad or Laptop, enter your password as prompted, and start accessing the internet – anywhere you travel! A: No. When you are using the Wireless Traveler high speed Pocket WiFi program you can use as much data as you need. It loads in 30 day prepaid bundles, which expires after 30 days. You would select the country in the zone you are traveling to and will be charged according to that rate for the bundle you select ie. 100 MB, 500 MB, 1 GB etc. You can set up a convenient automatic recharge feature, so if you need more data while traveling it automatically reloads so there is no disruption to your WiFi Internet service. Yes, if you are using the Unlimited Data Program, the data that you receive is unlimited, but it is subject to the International Fair Usage Policy. This means that you cannot stream video or use excessively large amounts of data in a short time period. Emails, pictures, internet browsing and GPS are fine, movies, Netflix, videos, SKYPE and Facetime require our High speed WiFi program mentioned above. All telecom companies that offer unlimited Internet access still require you to follow this policy. Where do I check order status and tracking details? How am I charged for data? The high speed program is a 30 day prepaid bundle. The data expires after 30 days. There is a convenient automatic recharge feature that you can set up on line if you are concerned that you may run out of data while traveling and do not wish to interrupt your data connection. The unlimited data program is charged at $12.95 per day for a minimum of 7 days. Billing starts at the beginning of your rental and ends on the return date of your rental. You will receive your rental a few days beforehand in case you have any questions prior to departure and you are not charged for these extra days. When you return from your trip you are given 5 business days to ship your rental device back to the Rental Returns Warehouse at Wireless Traveler Rental Returns, 225 Main Street, Northport, NY 11768. After this period you will be charged daily for late return fees. This gives you time to set up the device, up and ask us any questions you may have, before you leave. The WiFi devices are very easy to set up and use and they do include a one page User Guide in your shipment. You may also download a pdf guide from our website at WiFi Device User Guide Hyper Link or you can contact our helpful team at support@wirelesstraveler.com and we will email it to you. Where does my Wireless Traveler Pocket WiFi device work? Wireless Traveler Pocket WiFi Data services work in over 170 countries and the list is growing – soon to be available in Cuba! Let us know where you are traveling to and we will send you a list of our preferred partners in those countries, although your device is set to automatic and should select the strongest network in each country you travel to. How do I download the Wireless Traveler App? Go to the App Store on your phone or iPad and search for Wireless Traveler App. Go to the Google Play Store on your phone and search for Wireless Traveler App. I downloaded the App and it is asking me for an account and PIN number. Where do I find these things? Go to www.wirelesstraveler.com and enter your details to create an account and add funds. How do I buy an account for my friends or family? Go to www.wirelesstraveler.com and enter the details of your friends and family and select the amount of funds you would like to add to their app account, OR simply buy apps for them under your account. How do I make calls to the USA and Canada while abroad? How do I make calls abroad or locally in another country? Can I use my own account to buy apps for friends and family? Yes, you can login as an existing app customer and select the amount of funds that you would like to gift. Forward the account and PIN number to enter into their device after downloading the app. If you do not have a strong WiFi connection, or you are in a location where the network does not allow wifi calling (some cruise ships and airplanes) you will see this message displayed. Try to reopen the App in a different location. Should I turn off cellular data or data roaming when traveling and using the app? It is highly recommended that you turn off all cellular data roaming when traveling while using the app, as the app uses data to make calls and your network carrier will charge you for data roaming, which can be substantial. What are the benefits of the Wireless Traveler App? Allows travelers to make calls via WiFi to any phone from over 190 countries for as low as just $0.02 per minute… or enjoy free calling app-to-app. Available free from iTunes or Google Play app stores. Compatible with iPhone 4S, 5, 5S, 5C, 6 & 6 Plus as well as iPad, iPad mini & Android phones. Have friends and family download the app to connect for free from Europe. How is the Wireless Traveler App better than other calling apps? You do not need a plan from your carrier if you only want to make calls when you are connected to wifi. 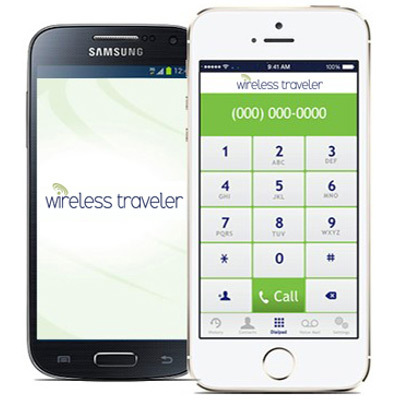 The Wireless Traveler App works independently of your cellular network provider. Do I need a plan from my network provider to use the WiFi App? The phone call will be answered by the app voicemail system (which you can customize) You will be notified on your device that you have a voicemail and you can check it on the app. When I am not connected to a WiFi network, what happens when people call my app number? Should I leave the App open after making calls? All apps can use a significant amount of battery charge. It is recommended not to leave the app open for prolonged periods. We advise you to close the app after making calls to preserve battery power. Simply swipe the app off your screen on an iPhone or go into settings and exit the app on your android. Yes, the app is free to download. You need a minimum of $5 of funds on your account for making and receiving calls. The cost of the calls are decremented from your account balance. App to app calls are FREE. How do I find out the cost of calls? Click on Rates and enter the country you wish to call and click calculate rate. All WiFi app calls to the USA from anywhere in the world are 2 cents per minute. (Calls to Canada are 3 cents/minute). It does NOT matter where you are calling from, ONLY where you are calling to. Does the App work on a ship or airplane? Usually cruise ships and airplanes use satellite wifi and tend to block wifi calling apps. Having said this, some cruise ships DO allow Wireless Traveler wifi calling, so you should try a test call while on your cruise. Otherwise, simply use it on your land trips when in wifi. How do I get assistance with setting up the app? Can I leave the calling app open on my Smart Phone? You should always close the app when you are finished making phone calls as all apps drain the battery on your Smart Phone. Simply swipe out of the app on an iPhone and press the page/arrow back on an Android and you will be prompted to close the app. Do I need my iTunes password for downloading the app? Yes, like all apps your download from the iTunes store, you will need to enter your iTunes password to download the app initially and again if you inadvertently delete the app from your iPhone. Should you buy a Wireless Traveler international Cell phone or rent a cell phone while traveling abroad? It depends on how low you are planning to travel and whether you are a frequent or infrequent traveler. Most Cell phone rentals are about $25 for up to 2 weeks or $50 a month, which is the same price to purchase a basic burner phone, which you keep. Rental rates start at 25 cents per minute for incoming calls and free incoming text messages. Therefore, most international travelers decide it is actually cheaper to purchase rather than rent a phone for the trip abroad. In addition, our low cost range of Smart Phones allow you to download all your favorite apps for low cost and free Wifi calling and free texting. For your convenience you can BUY now. Should you purchase a Wireless Traveler phone or just the global SIM card? Can I use my own phone with a Global SIM card? Yes you can as long as your Smart phone is unlocked (ie. All Verizon Smart Phones). AT&T will unlock your phone if it is 2 years out of contract or you have upgraded to a newer Smart Phone. Please contact your domestic service provider to find out if you cell phone is unlocked, or to help you to unlock your phone. View our Insert Your SIM card video for assistance in changing your SIM card when you travel abroad. How to know if your current phone is unlocked? It is best to check with your domestic network provider. All Verizon Smart phones are unlocked. In Canada you can request to have your Smart Phone unlocked for a fee. As the process can take up to a few days, you should arrange for your phone to be unlocked by your network provider well before your depart for your trip. How to insert your Wireless Traveler SIM into your unlocked Smart Phone? For iPhones you will remove the cover of your phone and locate the tiny hole in the right side or top of your phone. A tool came with your phone to firmly insert into this hole which will pop open the tray with your domestic SIM card inside. Note the way it is facing gold side down and shaved corner to the right as this is how you will place your Wireless Traveler SIM card into your Smart Phone when you travel abroad. We sometimes use a paperclip or earring stud if the iPhone tool is not available. See our helpful video to Insert Your SIM card. Remove your new SIM card chip from the plastic card that it is attached to. Try to avoid touching the metal circuitry contacts on your SIM card. Insert the SIM card into exactly the same position as your original SIM chip. Now close the tray and follow the Wireless Traveler Quick Start User Guide for your SIM card. We strongly suggest that you refer to your Manufacturer’s Handset User Manual for specific instructions on how to replace your SIM card. Turn on your phone and please go to our website www.wirelesstraveler.com to activate your phone prior to leaving for your trip. Please contact customer service at 1-866-700-3883 if you would like any assistance. You may be required to enter a SIM PIN number to allow your phone to register onto the local network once the phone is turned on. You will find the PIN number on the plastic card that your SIM chip was attached to. Please note that if you purchased a Wireless Traveler world phone that the SIM card is included in the phone. How long does it take to get your Wireless Traveler phone delivered to you? You can choose the FedEx shipment that is convenient for you. We offer 3 to 4 days ground delivery in the U.S. and Canada, 2 days, overnight express delivery and international shipments. You will be advised with a tracking number via email once your package has been shipped. You can also contact Customer Service with any other questions that you may have regarding your order details at 1-866-700-3883. How to forward calls to your Wireless Traveler phone number from your domestic mobile phone number while you are traveling abroad? You can forward all of your domestic call phone calls to your Wireless Traveler phone while you are traveling abroad as long as you have a U.S. (+1) or UK (+44) telephone number. Now you will never miss a call, even when you are traveling, unless of course you decide to do so. Simply check with your local network provider for your home, office or cellular phone as the method of forwarding calls varies amongst providers. Verizon as an example is *72 and the wireless traveler US number to forward the calls and *73 to remove call forwarding when you return home again. Does the Wireless Traveler global SIM telephone number expire? Does the US telephone number expire? What is included with the purchase of the Wireless Traveler phone? You will receive your Wireless Traveler phone with the SIM card included, a battery charger and international plug adapter. There will also be $15 FREE call value once your SIM card is activated with prepaid funds. There is a $12 one time activation fee on all phones and SIM cards (but does not apply to rentals). How do you charge your Wireless Traveler International phone? Simply use the battery charger included with your Travel Phone package. You can take the international plug adapter, which is 110-230v compatible, with you on your trip to charge your Travel Phone while you are away. Please refer to the Wireless Traveler Quick Start Guide that was included with your phone and your phone Manual. To make a call you turn on your Wireless Traveler phone. Your phone will search for the local network provider in the country that you are in. When it finds one, you should then dial the country code for the country you are calling to, then the area code and telephone number. For example if you were calling to the U.S. you would dial “1” followed by the area code and telephone number, ie. 1 631 421-1544. If you were calling to France, you would dial 33 followed by the rest of the phone number. There is no need to dial “00” or “011” or “+” when you use your Wireless Traveler phone to make a call. Your phone may use “Call Back”, which is the reason you receive Free incoming calls in over 60 countries. So once you dial the phone number, you press “send” on your phone (usually the green button) and then your phone will ring. Press send again and you will hear a message “Please wait while we connect your call”. Within a few seconds, the call will be connected to the person you are calling. How do people call you on your Wireless Traveler phone? Your Wireless Traveler Phone/SIM card has 2 numbers. You have a U.S. number (+1) and an international U.K. number (+44). People can choose to call you on either your U.S. +1 telephone number or your international +44 telephone number. Common courtesy is to give people in Europe your European number and people in North America your US telephone number so the person calling you does not incur long distance roaming charges. When someone calls you on your U.S. +1 number from the U.S. they will need to dial 1 and the rest of your phone number. They will be charged a local rate by their U.S. phone provider. When you are called on your U.S. +1 number, a $0.25per minute surcharge is applied. For instance, to receive calls in Europe would cost you $0.25 per minute, rather than being Free per minute incoming calls on the +44 number. When someone calls you on your U.K. +44 number from the U.S. they will need to dial 011 44 and the rest of your number. They will be charged an international rate by their U.S. phone provider. How much does it cost someone to call you? The person calling you would need to check with their local network provider to see how much it would cost them to make the call to your telephone number. If they call from the U.S. to your +1 telephone number, then they would be making a local call at local rates. If the person is calling to your United Kingdom (+44) number, they would need to ask their network provider what it would cost to make a call to a U.K. mobile telephone from America or wherever they are calling from. How do I make a call locally when I travel in a foreign country? The Wireless Traveler phone is an international phone, so you will always be making an international call. You always need to dial the country code first, even in the country you are traveling in, and then the rest of the telephone number. For example, in France all French phone numbers are ten digits, starting with a zero, when dialed from within France. However, when calling these numbers with an international phone you dial without the zero. Just dial the country code 33, then the French number without the initial zero. For example to call 06 12 34 56 78 from your Wireless Traveler phone dial 33 6 1234 5678. What is the cost for using Voicemail and calls to customer service? The charge for retrieving voice mail messages is the same rate as outgoing calls from the country you are calling from. Receiving voice mails is charged at the same rate as an incoming call while in the country you are in when the call was received. Calls to customer service are charged at the same rate as outgoing calls from the country you are calling from. The Wireless Traveler Short Codes allow you to access your voicemail and customer service by dialing a 3 digit number. 121 – is the short code to collect your voicemail messages. The voicemail function is already set up for you when you receive your phone. 154 – is the short code to contact customer service from anywhere that you are traveling in the world. How do I send text message? You send a text message the way you would normally do, just be sure to dial the country code first and then the telephone number. You can also check your manufacturer’s handset manual that came with the phone. You will receive FREE incoming text messages worldwide. 1-866-700-3883 and we would be happy to assist you. How do you make an emergency call? You can make an emergency call from anywhere, just dial 911, 999, etc. You would be advised to check the country you are calling to for the emergency numbers in that country. In which countries will the Wireless Traveler phone work? Your Wireless Traveler phone will work in over 190 countries. Please check our Country Coverage and Coverage Map. What are the rates to make and receive calls? Please check our rates by selecting the country you will be calling from and calling to with your Wireless Traveler phone. How to put prepaid airtime onto your phone or SIM? When you receive your phone or SIM please activate it by clicking on Activate SIM or Phone. For your convenience the phone and SIM cards work on Automatic Recharge, to ensure that you will always have funds and be able to make and receive calls while abroad, especially in an emergency. You will not need to interrupt your trip to find a computer to add call value to your phone. When you activate your phone you will select a minimum account balance that you wish to maintain. You will also be given the option to select the amount of call value by which you wish to top-up your account when it reaches your minimum balance. With this function you always have peace of mind while traveling. Does the call value ever expire if not used? The call value remains on your account until you use if for your next trip abroad or up to 14 months from the time you purchase the prepaid airtime. How to check your credit balance? Click on My Account and enter your user name and password, then your balance will be displayed. You can check your Call History and change any of your personal settings, such as minimum balance, recharge amounts or credit card details. What is the Automatic Recharge process? When does the charging start for the call? You will be charged as soon as the person you want to call answers. What is the charging interval? The charging interval is one minute. What if you lose your phone or SIM card? Please contact Wireless Traveler’s Customer Service at +1.631.421.1544 or email us at support@wirelesstraveler.com and we will block your account to avoid unauthorized use. You can order a replacement Wireless Traveler SIM Card via the Wireless Traveler website and add prepaid airtime. Funds can not be transferred between SIM accounts. How do you set up your voicemail? Your voicemail is already set up for you with a pre-recorded message. How do you know when you receive a voicemail? Your phone will ring and you will receive a text message free of charge to inform you that you have a new voicemail. You can then dial 121 to retrieve your new voicemail message. Regular calling rates apply. How do you collect your voicemails? You dial 121 to retrieve your new voicemail message. What does it cost to call your voicemail and collect your messages? Collecting your voicemail is free. How do you forward your calls from your U.S. phone? Please check with your normal network carrier of your U.S. phone (office, home or cellular provider). Each carrier has their own unique method of forwarding calls. Then simply forward it to your +1 Wireless Traveler number. Please note that customers from the U.K. would forward their phones to their +44 Wireless Traveler number. Can you port a local number (replace your Wireless Traveler Number with a regular phone number)? How do you make data connections? Please refer to your Quick Start User guide for data connections using your Wireless Traveler global SIM card or phone. Also, please review our very cost effective Pocket Wifi devices with high speed data services and Unlimited Data Service device for emails, web browsing and GPS. How do you move your contacts onto your Wireless Traveler SIM card? Please proceed as described in the manual of your cell phone or alternatively you can purchase a SIM Bank device from our products page. A SIM card or Subscriber Identity Module is a portable memory chip used in some models of cellular telephones. The SIM card makes it easy to switch to a new phone by simply sliding the SIM out of the old phone and into the new one. The SIM holds personal identity information, cell phone numbers, phone book, text messages and other data. It can be thought of as a mini hard disk that automatically activates the phone into which it is inserted. The Wireless Traveler Global SIM card also provides you with an international cell phone number. By inserting this SIM into your unlocked, Smart Phone you can use the phone in over 190 countries. What is the difference between GSM and CDMA network providers? SIM cards are used with carriers that operate on the Global System for Mobile Communication (GSM) network. The competing network is Code Division Multiple Access (CDMA), a technology used in the U.S. (Verizon & Sprint). Most CDMA cell phones do not support SIM cards in most parts of the world, although this is changing. Firstly, you should check with your cell phone provider to find out if your phone is locked or unlocked. If it is locked, simply ask them to provide you with the unlocking code. A representative at Wireless Traveler would be able to help you out with this if you contact us at 1-866-700-3883.